Enroute to the Dieppe Raid of 19Aug1942, the men of the SSR were carried to the battleground by the HMS Princess Beatrix, one of nine landing ships used that day. In this section of the SSR website we honour this vessel with photographs, stories, details about the ship, and the history of her World War II activity. If you have images, stories, or other details about the HMS Princess Beatrix we will gladly add them to this page. 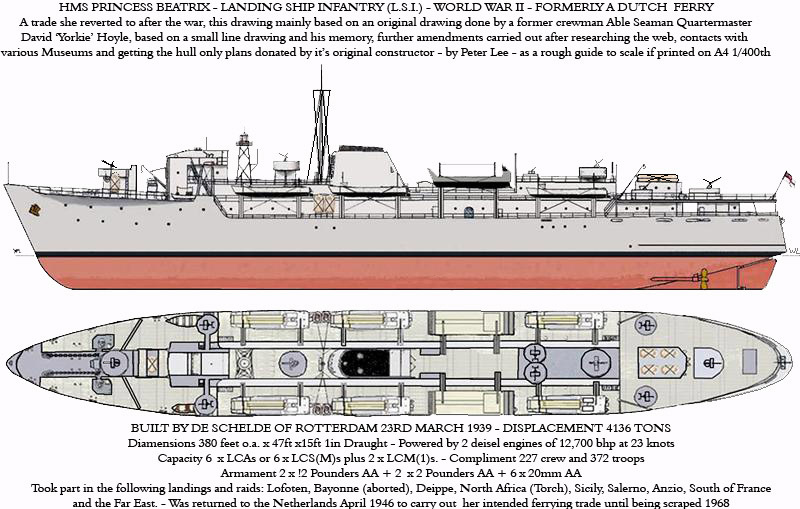 There are twenty references to the HMS Princess Beatrix in the SSR web site. HMS Princess Beatrix saw action during Operation Claymore at Lofoten(Norway), Dieppe(France), Arzew(near Algiers, north Africa), Sicily(Italy), Sierra Leone(Africa), with Force Roma heading for Penang(Malaysia), and during Operations Romeo and Dragoon at Cap Negre(France). According to The Ship List (http://www.theshipslist.com/ships/lines/feeders.html) she was built in 1939, ran on the Harwich-Hoek Van Holland ferry route, and was scrapped in 1968. 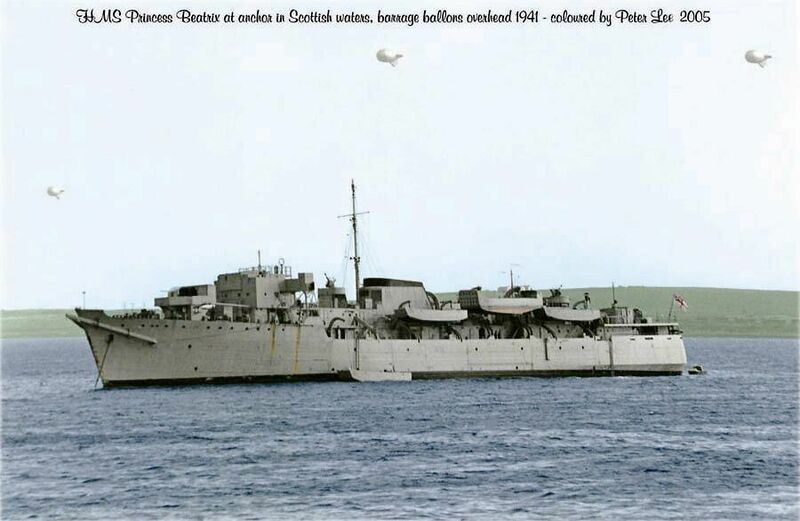 HMS Queen Emma was a commando troop ship of the Royal Navy during the Second World War. Emma was built as the Koningin Emma, in 1939 as a civilian passenger liner. She was named after Queen Emma of the Netherlands. She ferried across the North Sea between the Hook of Holland and Harwich, along with her sister ship, Prinses Beatrix (Princess Beatrix). In 1940, Koningin Emma was requisitioned by the Ministry of War Transport and renamed HMS Queen Emma. Prinses Beatrix was also requisitioned, becoming HMS Princess Beatrix. Queen Emma was converted to a new role as a troopship at Harland and Wolff's yard in Belfast. 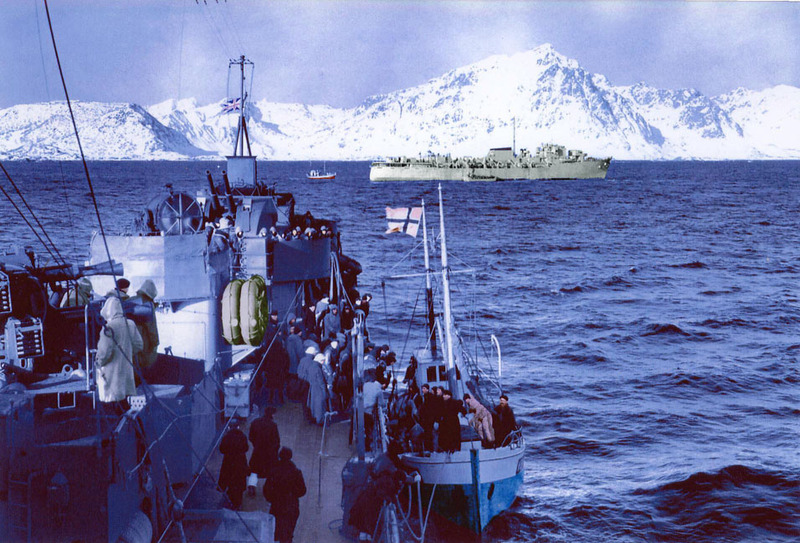 During the war her main role was transporting British Commandos, and she participated in the Lofoten Islands Raid and the Dieppe Raid, amongst others. She had the advantage of a high speed that allowed hit and run operations. 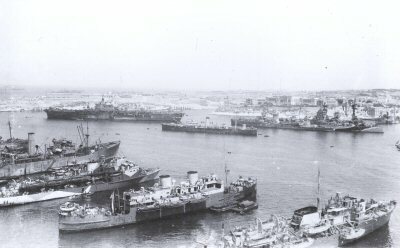 In 1941, Queen Emma, Princess Beatrix and HMAS Dunedin were at Freetown, Sierra Leone, returning to the United Kingdom having taken troops to Egypt. They were ordered to help the Royal Navy and the U.S. Navy with the search for a surface raider (later identified as the Atlantis). In 1946 Queen Emma was released back to her owners and continued to ferry until 1969, when she was scrapped in Antwerp, Belgium. We landed 1st Battalion American Rangers assault troops on beaches at Arzew, a port south of Algiers, at 2 a.m. on the 7th of November 1942. There was very little action through the night but in the morning there were some air attacks by Vichy French aircraft. They caused no damage and were soon fought off. Once the Rangers had consolidated their positions on the beaches we sailed on to Algiers companioned by the Royal Scotsman, Ulster Monarch, Queen Emma and Princess Beatrix. Our task was to ship troops from Algiers to Bougie and then, as the Germans retreated eastward, to Phillipville and Bone to meet up with the eighth army in Tunisia. The five ships were nicknamed 'The Moonlight Squadron' and the route up the North African coast became known as 'dive bomb alley' because it was there that we were greeted by Stuka dive bombers on every voyage. After the fall of Tunisia we moved on and operated from the ports of Souse and Sfax. Ulster Monarch and Prince Baudoin, Malta 1943.
the deck of Sicily-bound HMS Princess Beatrix, July 1943"
off Norway, 4th March 1941. I have in the past read with interest the exploits of the South Saskatchenewan Regiment, at Dieppe via "The Green Beach" by James Leasor, publisher Heinemann. My interest is that my Uncle Stanley Lee (deceased), was an AB Quartermaster (Coxswain) on the HMS Princess Beatrix from the Lofoten Raids right through to the Japanese surrender in the Far East, he was on that Dieppe raid, possibly chauffeuring your gallant men up in the bridge. 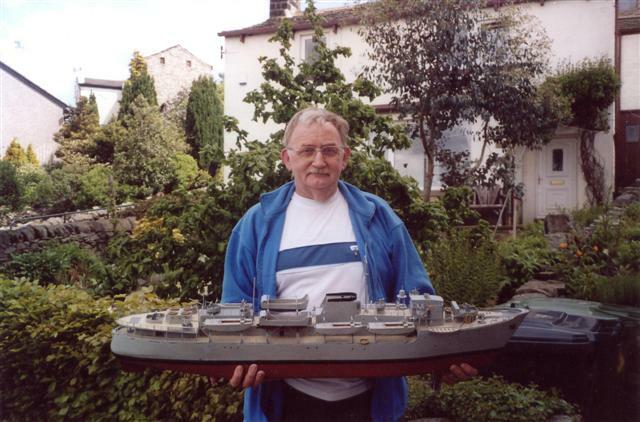 I have enclosed a few pictures of my attempt at modeling HMS Princess Beatrix taken when we went to see another crew member, David 'Yorkie' Hoyle. He didn't join the ship until the North Africa "Torch" Landings (that me holding the boat to give you an idea of the size of her). I hope you and your Regiment's Veterans like my effort, bearing in mind it's an 1/100th stand off scale radio controlled , ergo not true scale, model of her later in the conflict. For example the hull below the waterline is wrong and it was based on a small line drawing sent to D.Hoyle, by myself when I first made contact with him, who then from memory filled in the details (he being an accomplished artist), and with research on the web and Various Museums between us we have come up with a fair redendition. Apart from some of the smaller armament and fittings, most of its guns, radar, davits, LCA's, LCM's and their launch ramps are scratch built. From beginning to end if you can ever say you've finished a model (hah! hah! ), it's taken about 5 years to construct. We eventually were given the Hull only drawing at 1/50th scale by her shipbuilders, De Schelde, too long into the build as the hull was already finished and had been tested without uppersuperstructure, it was found to be a very stable and responsive so we left well enough alone. I may in the future re-do her as a ferry using that hull drawing as a base. One never knows. You have my full permission to utilize the photographs as you see fit. If you have any photographs of the Princess Beatrix I would be interested to see them. I have the one of the Postcard on your site, by the way. 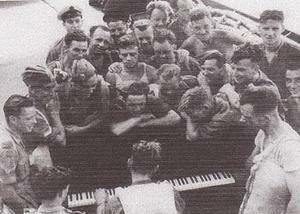 BEATRIX when she carred the Regiment on Dieppe Raid.